Last week Toronto Star reporter Royson James* spoiled my breakfast. What he said was very upsetting… Why did he have to spoil my illusion? I thought I was being healthy and green! If you would like to call and ask Loblaws too, the number is 1-888-495-5111. Of course, the other side of the coin is that perhaps Toronto needs to upgrade their recycling capability…. But in the interim, why can’t Loblaws use paper cartons? Loblaws charges a premium for these fancy eggs — and I’ve been willing to pay it as I imagine the chickens happily running around in an “open concept, weather-sheltered environment, where they are free to roam, feed, roost, nest and perch.” That’s what the packaging says. Am I sucker or what? But somehow the image of chickens cooped up in tiny little cages makes my stomach churn. It doesn’t sound healthy for the chickens (or us humans). The Plastic Egg Carton has attracted bad press and infamy before. 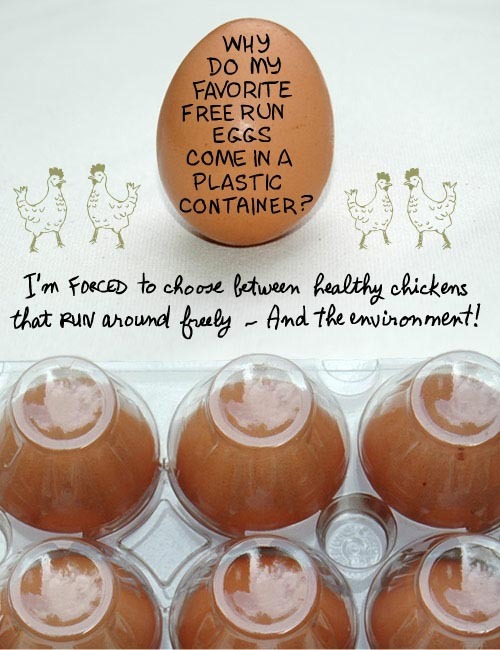 In February 2006, Treehugger awarded the Plastic Egg Carton the Waste of Packaging Finalist Award. They took issue with the extra flap needed, which increased the size of the package by 50%. They recommended going back to recycled paper cartons. Another reminder that simple is often the best. Fruit and vegetable containers made of plastic aren’t recyclable either (in Toronto at least). * Royson James is no relation. Why not place a ‘wanted’ ad in your local paper, asking for free-range eggs from a backyard producer? I would bet good money there is someone in your local area who keeps chickens, and has more eggs than they know what to do with! People who keep chickens usually end up giving them away, but if you offer to pay a fair price for the eggs, I’m sure you’ll find a ready supplier. Another alternative is to go on talkback radio, and explain your problem. I bet someone will come back very quickly with an offer of healthy eggs from happy, free chickens! A third alternative is to go to yor local farmer’s market, or organic market. We have a place called CERES near us (http://www.ceres.org.au), where they grow organic veggies and raise hens. You have to be quick to get the eggs on Saturday mornings, as demand is strong, but they do sell the eggs for a fair price. Daharja — what great practical suggestions! Thank you! Buying local food is certainly one option to solving the egg dilemma. The big ugly picture of non-reyclable packaging is one I hope will change in the next few years. Toronto is going to start charging for garbage — once people realize all the packaging that is not accepted (egg cartons, fruit and veggie containers, etc.) they will get more vocal. Nothing like being hit in the pocketbook to make people angry. I used to work on a farm, and when I first saw the chickens cooped up in those cages I was almost sick to my stomach. It wasn’t until I had worked there for a couple of years that I realized they were a lot safer there.. many of the farmers informed me that when the chickens are in a coop and free to run around there are many problems. There is a pecking order that develops if the chickens are kept alive too long, and the hens will literally peck at other hens until they have open wounds (really vicious). There are several other cons in letting hens run around that you don’t see when they are caged. I am not saying that caged is the best way, i feel that keeping mass quantities of any animal is extremely cruel. The best way to buy eggs are from your small local farmers.. but living in the city without a car can prove that quite a challenge.